Ah, egg rolls. Ever wonder how to make egg rolls? One of those tasty comfort foods that is worth every single last bite–whether it is served up in Chinese restaurant or made from scratch at home. Yes. You can even make egg rolls at home from scratch with a few simple tools. 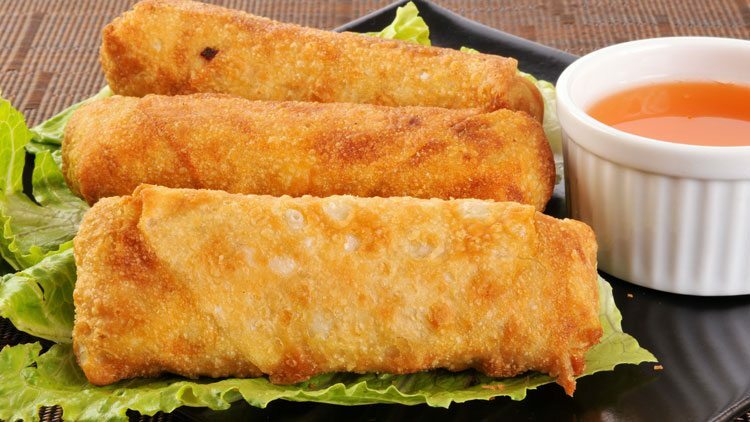 This recipe makes 8 egg rolls, perfect for four people if you’re preparing the recipe as a main dish. If you’re serving them up as an appetizer, you’ll have enough on hand to serve eight. We like to pair these egg rolls up with Asian Rice Bowls, Gluten Free Chicken Fried Rice, and even Copycat Panda Express Chow Mein. Whichever you choose, you’ll end up with a dinner that is sure to hit the spot. We like to use an air fryer to limit the amount of oil used, but you can use whatever fryer you have on hand…or pan fry for that matter. 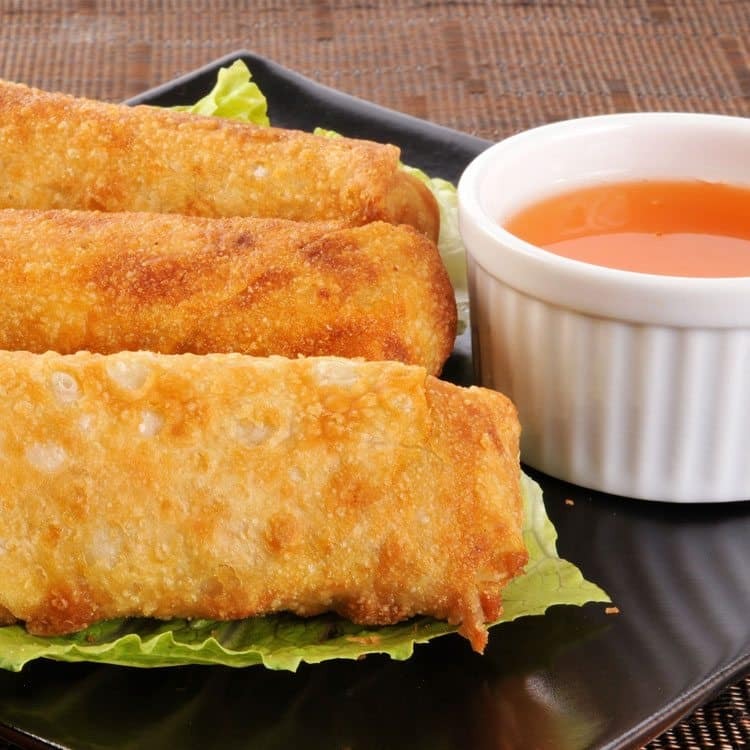 The trick is to flavor these yummy egg rolls up, and part of how that is done is the manner in which they are cooked. 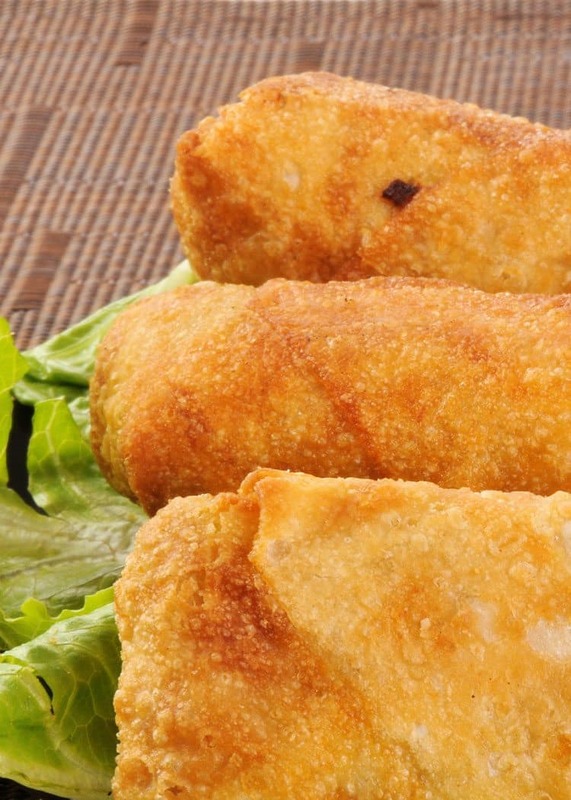 When you choose an option with less oil, you’ll get a healthy egg roll recipe that results in calories saved. And that, my friends, is always a big win. These make a great little appetizer to start out the evening. Serve them with sweet and sour sauce on the side. Place the vegetable oil into a deep fryer and allow it to heat to 365 degrees. Place the chopped chicken into a mixing bowl. Add the mushrooms and celery and toss to combine. Add the soy sauce and mix until all the ingredients are coated. Sprinkle in the curry powder and blend together well. Lay the egg roll wrappers out flat. Spread 2 teaspoons of the chicken mixture into the middle of each wrapper. Fold the corners in and then fold the ends up over the corners. Moisten the underneath side of the wrapper with a little water to seal. Fry the egg rolls 2 at time for 3 minutes or until a nice golden brown. Lay the egg rolls in a single layer on paper towel to drain.